- If you're in Team Folder or a Secured Folder with only one view, the library opens on the view. - To navigate to the homepage of your library, press the library name in the breadcrumb in the library header. Breadcrumb, which shows the path of your current location. Learn more: Use the navigation breadcrumbs. User menu to switch between accounts and domains, enable or disable the beta editor and logout from AODocs and your G Suite session. Administration menu where library administrators and super administrators can access the Library administration, Library security and Import status. Learn more: What is the library administration? and Review the document import operations. Note: Only super administrators can access the Import Status menu. AODocs search bar: use the search bar to find documents you have access to. New button: use this button to create a new document in the library. Learn more: Create documents in Document Management libraries. List of views: the views of the library are configured by the library administrator. Learn more: What are views? List of workflow tasks: displayed only when your library has been configured with a workflow. It displays the number of documents where you have a pending workflow action for each workflow state. 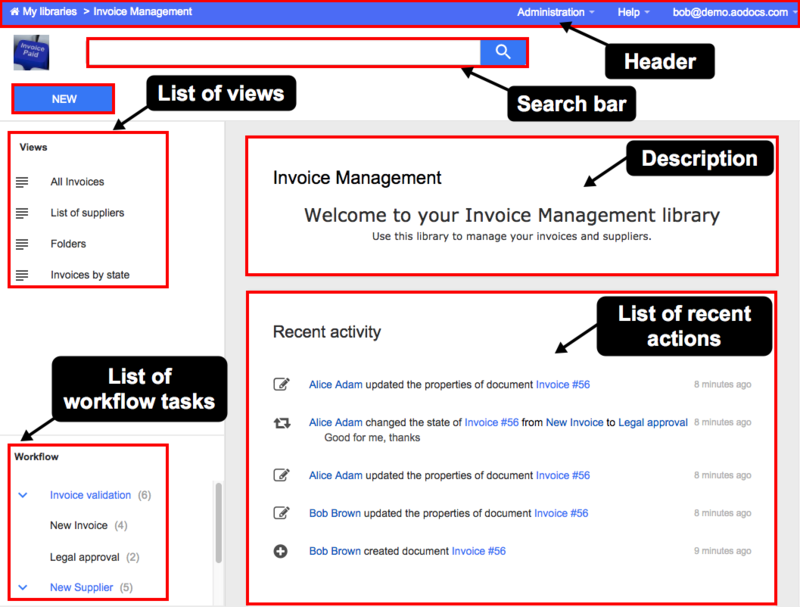 Learn more: Browse the workflow tasks in your library. Description: this can be customized by library administrators with text and images to describe your library. Learn more: Customize your library homepage. Recent activity section: this displays an activity log of the library, such as creation and update of documents and workflow actions. A maximum of 10 activities are listed. When there are more activities than the listed ones, a link Show next events appears. You can view more activities from the audit log. Learn more: View the library audit log. - In the Recent activity section, users can see only the events on documents they have access to. - If your library administrator has configured the Recent activity section to be displayed only for groups or roles of which you're not a member, it is not displayed.